In addition to seasonal fresh fruits and vegetables, there are a variety of cheeses, locally raised meats (beef, pork and chicken), handmade Italian style salami, fresh seafood, olive oil, wine, baked goods, locally roasted coffee, candies and more. If being around all that delicious food makes you hungry, no problem! There are a variety of prepared foods as well – made to order burritos, tamales, Thai food and freshly made guacamole and chips are all available. By 8:30 a.m. or so, while the farmers are busy finishing their set up, the early bird shoppers begin to browse the vendors’ tables, checking out what’s new in the markets and where the best looking items are, before the market opens at 9. Once the cow bell rings to begin selling, the crowd builds steadily. Experienced shoppers know that the best produce can go quickly, so it’s good to shop early for the best selection. By 10, the market is in full swing – the kids’ playground is buzzing with activity, the musicians who gather to show their chops are attracting appreciative listeners, and local groups are manning their tables to spread the word for their favorite issues and causes. And of course, the vendors and shoppers are busy attending to the main event, offering the best local food to the community. As the sun gets above the trees and the early chill fades, the park really begins to hum. There is often an obedience class for the community’s canine members (and their owners), folks may set up for a birthday party or a wedding in the gazebo later in the day, and lots of shoppers pause to chat with friends and neighbors or enjoy a bite to eat and a cup of fresh-roasted coffee or veggie juice. Saturday morning at the Farmers Market is also an opportunity to get to know the folks who produce the food that sustains our community. All of the vendors are very proud of the products they offer, and are happy to talk with you about their farming practices and how best to prepare and enjoy their produce. 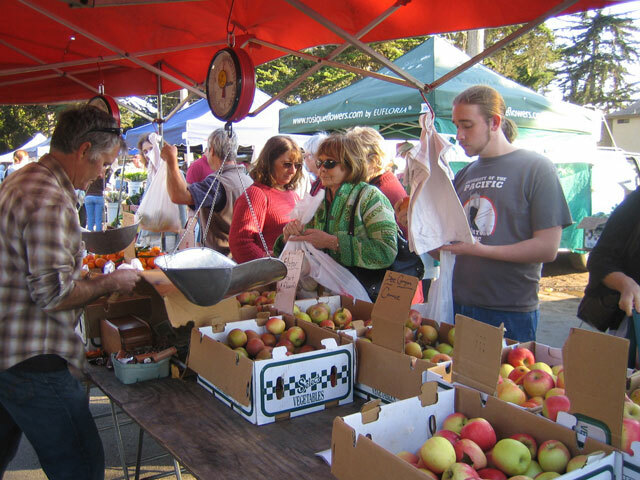 Visit the Templeton Farmers Market and experience the heart of the Community.